Without a doubt, the best fish tacos in Boston can be found at La Verdad on Landsdowne. I am right, people. If you beg to differ, please speak up. But I’ve had my share of fish tacos from coast to coast (actually, only on the coasts), and Ken Oringer’s are tops. Now, I’d love to head on down to La Verdad every single day and have a plateful of those delicacies, but that’s not possible. And we’re still trying to nail down ingredients and technique to replicate those at home. Meanwhile, to satisfy the fish taco craving, we’ve taken a turn at a Boston Globe fish taco recipe. It’s tasty and pretty darn easy. Combine all ingredients in a large shallow bowl. Season with salt and pepper. Let it sit for about an hour. Whisk together yogurt, zest and juice. If it’s too thin/watery, add a touch more yogurt. Add in a few dashes of hot sauce to taste. 1+ lb. firm white fish. We use tilapia for our fish tacos. We’ve used cod and that’s fine, too. Tilapia is less expensive. So sue me. Cut fish into 1/2-in. pieces and place into a small bowl. Add a swig of evoo – about 1 TBS – and toss to coat. Season with salt and pepper and toss. If you want to add another level of flavor, go ahead. The original Boston Globe recipe suggests about 1 tsp of cumin. We tried that. It’s fine. Although it gives the fish an off-putting grey-brown color when prepared. To cook the fish, we take about half of the fish, place it on the tray that comes with your toaster oven, and just broil it in the toaster oven for about 5 minutes. And that’s it – done! Heat a whole-wheat fajita wrap (the 8-in. size) in a dry pan of medium heat. Fill with about a third of the broiled fish. Top with the cream sauce and slaw. The first batch of broiled fish will make about three tacos. For a dinner for two, have one each, share the other (no, there’s nothing gross about that), and have a side of something like caramelized onion and mushroom quinoa. While you’re cleaning up the dinner dishes, pop the other half of the fish in the toaster oven for 5 min. 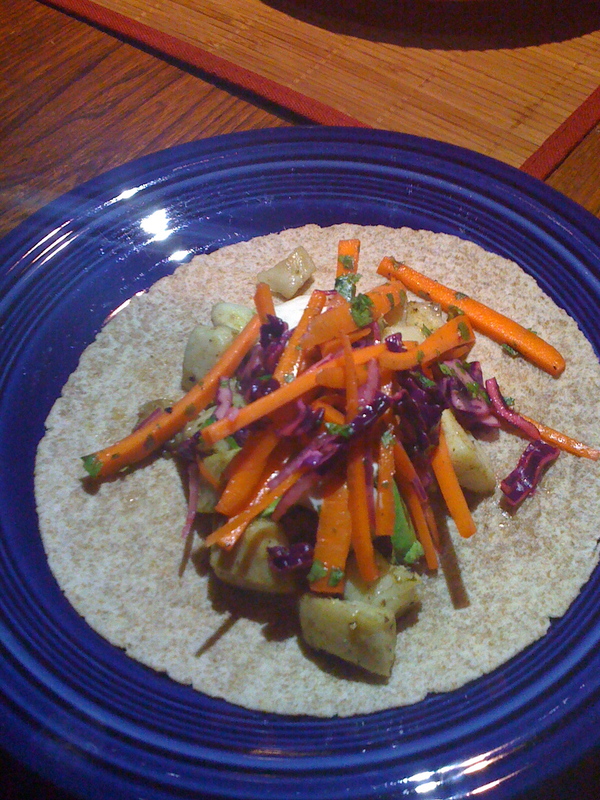 It heats up well for a lunchtime fish taco the next day. You are currently browsing the Mexican category at The Dainty Dot.